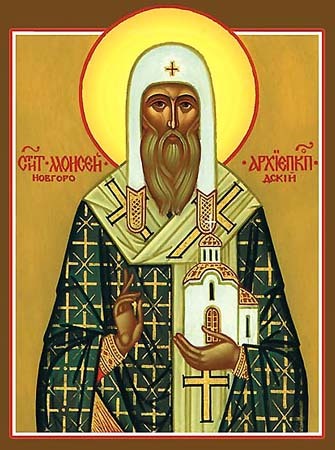 Sainted Moses (Moisei), Archbishop of Novgorod (1325-1330, 1352-1359), in the world Mitrophan, was born at Novgorod. In his youth he secretly left his parental home and entered the Tver Christ-Child monastery, where he took monastic vows. His parents found him, and at their insistence he transferred to the Kolmov monastery near Novgorod. At this monastery he was ordained to the dignity of priestmonk, and later at Yur'ev monastery he was elevated to archimandrite. After the death of the Archbishop David, Sainted Peter (+ 1326, Comm. 21 December) consecrated him in 1325 to the dignity of Archbishop of Novgorod. But Saint Moses did not guide the Novgorod flock for long. The quarrels and contentious factions, the conflagrations and other misfortunes weighed heavily on his soul, which sought for monastic solitude. In 1330 the saint withdrew to the Kolmov monastery for tranquillity. But here also he did not long remain. Having searched out a desolate spot at Derevyanitsa, he built there a stone church of the Resurrection of Christ. At this place the monk spent more than twenty years at monastic deeds. Having yielded to the requests of the Novgorod people to be their spiritual head, he returned anew to his flock. The ancient chronicler describes Saint Moses thus: "He shepherded his flock like a good pastor; he defended the downtrodden, and protected destitute widows; having gathered a company of copyists, on his account many a book was written, and he confirmed many things in piety by his guidances". In the year 1354 the Constantinople Patriarch Philotheos (1354-1355, 1362-1376) in token of deep respect for Saint Moses gave permission for him to make use of an ancient prerogative of Novgorod hierarchs – to wear the Polystaurion garb ("Krestchataya Riza", meaning "of many crosses"), which also he sent him. He likewise permitted Saint Moses to deal directly without intermediaries with the Constantinople Patriarch. Archbishop Moses continued for seven years the second time around as hierarch, a period marked by the building of many churches in Novgorod and its surroundings. In 1352 a stone church in honour of the Dormition (Uspenie) of the MostHoly Mother of God was built by the saint at Volotova; in 1355 a monastery was built in a locality named Skovorodka, with a stone church in honour of the holy Archistrategos of God Michael; in 1357 also churches were built at three monasteries: at Radogovitsa near the Volotovsk Dormition church, and at the Spirit (Dukhov) monastery and at a women's monastery – churches in the name of Saint John the Theologian (the first and third of these monasteries were founded by Saint Moses). In 1359, feeling weak and sick, the saint withdrew into the Skovorodsk monastery founded by him in the name of the holy Archistrategos of God Michael. Saint Moses asceticised here until his death on 25 January 1362. He was buried at the cathedral church. The archbishop of Novgorod Sergei, in 1484, having come to this cathedra from Moscow, gave orders to a priest to open up the grave of Saint Moses. "I dare not, Vladyka, to be so bold as to open up the relics of the sainted hierarch. It is thy task as hierarch to open the grave of an hierarch", – answered the priest. "Look what is on this corpse!" – said the infuriated archbishop, but he was soon punished. Having gone insane, he was not able to govern the cathedra and did not become well, until he took the schema at the Khutynsk monastery (+ 1504 at Trinity Sergeev monastery). The establishing of a feastday to Sainted Moses on 19 April is connected with a proper opening of his undecayed relics in 1686.